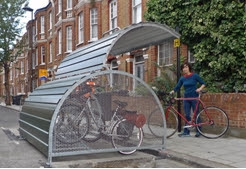 Lambeth Cyclists has run a fact check analysing the cycling related claims made in Lambeth Council’s “Sustainability Update” to the Council's Cabinet on 19 March 2018. For there to be any significant growth in cycling, segregated infrastructure is required on the busy roads that are usually the most direct routes from town centre to town centre. Routes designated on roads without segregation need to have a very low level of motor traffic - ideally below the Dutch guidance of 2000 Passenger Car Units (PCUs) per day or at least TFL's benchmark for Quietways of 3000 PCUs. Segregated space for cycling is required on busy roads. Lambeth “Quietway” routes have not currently filtered out through traffic so large sections remain both too busy and too fast - they will fail to create conditions for increased cycling. Lambeth’s focus remains far too much on ‘soft’ measures such as training, parking and cycle hire. These improve conditions for existing cyclists but do not address the reason most frequently given for not cycling - worries about safety, and fear of motor traffic in particular. They are not, and cannot be, a substitute for a safe and attractive cycling environment.